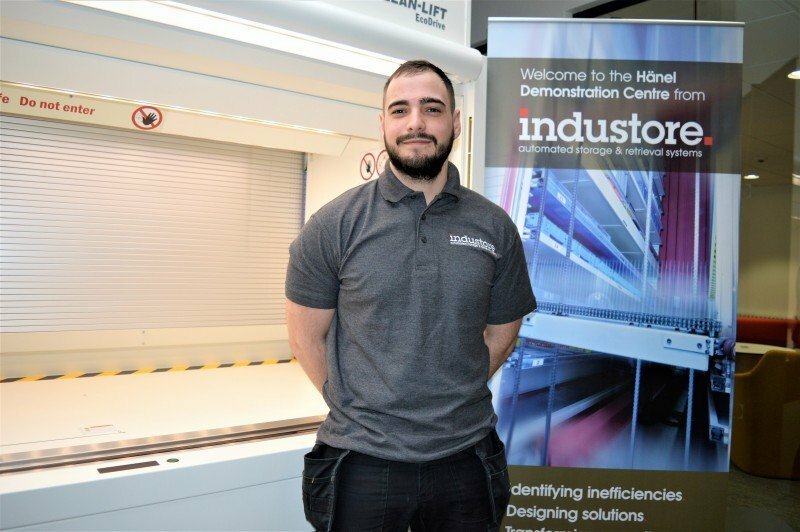 Back in March 2017, our new engineer Jamie Thrupp, was the first Industore installation technician to join the engineering team and complete the BTEC Level 3 Certificate in Engineering (QCF) (Electronic) read about it here. Now, 15 months later, we’ve decided to have a catch up with Jamie and find out how he’s doing in his new role. So Jamie, we’ve heard that you’re a fully-fledged engineer now, how’s it going? Good thanks, from a day to day perspective I’m mainly working through our list of services for the new aftercare plans, but I occasionally meet up with another engineer if there’s a two-man job to attend. I’m on different sites most days of the week so no two days are the same, I’d say the main difference is having my own vehicle and being able to manage my own schedule. Sounds great, is it much different to working in an installation team? As enjoyable as working with the install team was, I thought it was time for a career that presented new challenges and now I get to work on machines that are established – I’ve seen some that are almost 20 years old! There’s also a real variety in size, some can hold up to a tonne on each shelf and when you’re working on machines like that, two people are needed to manoeuvre the heavier parts, so I still get to work as part of a team every now and then. As I go through additional training I’ll get sent to more complex jobs, and eventually I’ll be part of the First Response team. Recently I’ve been working through additional training material in the office, as well as all our usual refresher qualifications like forklift training, manual handling, health and safety courses and MEWP operator training. Whenever we work on the Hänel machines we need to make sure what we are doing is safe, and when we inspect them it’s to make sure they meet specific safety regulations, like EN-15095 and PUWER. PUWER is essentially a regulation that ensures the health and safety of people at work, specifically when using powered equipment. Employers who use equipment like ours need to have their equipment checked by a manufacturer trained professional, and at the moment this is what I’m spending most of my time doing, completing safety inspections and services. Sounds important! Do you have much more training to do? I completed Hänel’s CS1 and CS1i over a two week stay in Germany, and most recently I have completed CS2. This means I can safety check and service all machines, carrying out preventative maintenance checks and identifying areas of improvement. A few of the older machines I’ve visited haven’t upgraded their technology since it was first installed, but the CS2 training I’ve had also covers technology assessment, so I can also identify ways to upgrade machines, not just service them. I’ll be booked to complete CS3 in the near future and once I’ve completed this I’ll be a Tier Three Hänel engineer. I actually really enjoyed my time training at the Hänel factory, when you know what details to pay attention to and what questions to ask you can gain a lot from their classroom style learning. These machines have been designed by German engineers so being able to gain insight into how they work is really useful. The Hänel staff are very good hosts too; we were taken out to lunch each day and advised on restaurants for the evenings. I can see why the Germans are famed for their efficiency – we were constantly on the go! Well it sounds like it’s going well so far, thanks for giving us an insight – I’m sure we’ll be asking for another catch up soon! Jamie is one of our national engineering team members, dedicated to the maintenance of Hänel machines throughout the UK and Ireland. If you’re an existing client looking for more information on the aftercare services we provide, please contact us on +44(0)29 20 23 9000 or fill out our enquiry form here.